In his solo show at Vessel Gallery, local artist Evan Holm plays music with pools of ink and mounds of flour. 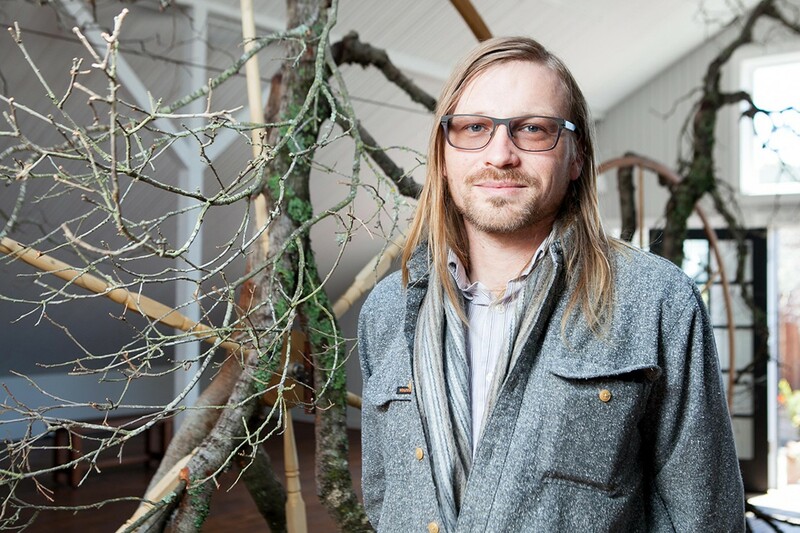 Evan Holm turned Vessel Gallery into an immersive music player. 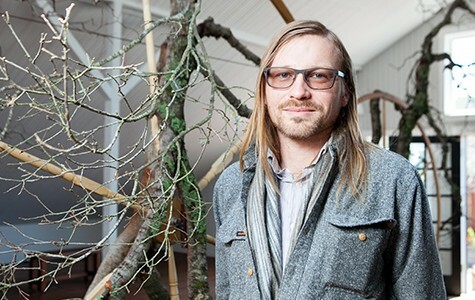 Evan Holm's "Forest Pools" unfurls a world from inside a cassette tape. The installation, currently on view at Vessel Gallery (471 25th St., Oakland) for Holm's solo show the river made no sound, is made up of shallow pools of water and black ink that span the length of the upstairs showroom — 78 feet long. At the center of the stagnant stream, three deconstructed cassette tape players are mounted just above the dark liquid, each dissected to reveal only the fundamental skeleton of its mechanism. But instead of being wound up tightly around two spools, each tape is wound around the entire installation, held in place at each end by large, wooden wheels. Those are, in turn, secured by sculptural oak branches on one end and antique steel framing on the other. Each wheel slowly rotates as the tapes are wound by the tiny engine inside the tape players, creating the subtlest ripples on the surfaces of the hyper-reflective pools and emitting a meditative composition through connected speakers. "Forest Pools" elaborates on one of Holm's previous pieces called "Submerged Turntables," which was a functional record player in the form of a pool of blackened water, with oak branches growing out of it. In 2013, he charmed audiences when he DJ'd with the turntable in the atrium of the San Francisco Museum of Modern Art. Holm also has a performance aspect of Forest Pools, in which he uses a mixer to switch between the three tapes being played, while Hanna Rifkin sings covers transcribed to match Holm's compositions and Alexandra Stefans accompanies on the electric cello. The next and final performance of the piece will take place at 8 p.m. during First Friday on June 5. The river made no sound includes another immersive installation on the first floor of the gallery, entitled "Cloud | Clock," for which Holm hand-cut webbed wooden patterns that are hung from the ceiling, overlapping in midair like clouds. Holm sifted six hundred pounds of flour over the trellis-like structure to form a mesh of tiny, white mountain ranges and a blanket of soft, desert-like dunes below. In this sculpture, too, a dissected cassette player and tape weave through the apparatus, wound around wooden wheels. The core elements of the river made no sound are mildy overdone concepts when presented in isolation. In Forest Pools, that's the nostalgic fascination with analog musical formats, collapsing the dichotomy between "nature" and "machine," and the zen-like aesthetic of sumi ink pools and carefully arranged branches. But the intersection of those aesthetic statements, and the incredible precision with which they are combined and executed, forms a composition so earnestly committed to its design that it would elicit a pleasing sense of whimsicality even from those who swear against artwork that could be aptly described as "ethereal."